Wonderful waterfront home on the shores of Lake Anna. This home boasts 650 feet of water front, easily sleeps 10 people. There are 3 bedrooms; queen bedroom 1, queen bedroom 2, queen, with single bunk in bedroom 3. Additionally, there is a pullout couch, and 1 inflatable bed. There is 1 large 50 inch flat screen screen TV in the living room with Direct TV expanded liineup, then a second 50 inch flat screen with expanded direct TV in Master bedroom , last an additional TV in the den hooked up to X box 360 with 4 hand held devices, and a number of good games for the PS 3. The home is chocked with many board games, as well as movies for those rainy days. There are 2 wooded acres, so you will have plenty of privacy. The home is located in a cove, thereby less boat traffic. There is a wonderful deck area next to the water. The deck area has some outdoor furniture including a large couch, and 2 chaise lounges. BOAT RENTAL: This home has a 2006 Stingray 185 L/S open bow boat available to rent. There is a another agreement required to rent the boat. Rental fees on the boat are as follows, 200/day rental, or 1000/week. Security deposit is 200 dollars, and is refundable. If you are interested in renting the boat you would need a 2 inch tow ball. If you are not able to tow the boat, I do have a service fee of 40 dollars to drop in and take out boat. I have a handyman that can do this for you given proper notice. There is no additional charge for towables and water ski gear. This home comes with a stone patio and stone fire pit, and wood is well stocked. There are 4 full bathrooms. There is also a seafood jet ski for rent. This fee is 300 per day. 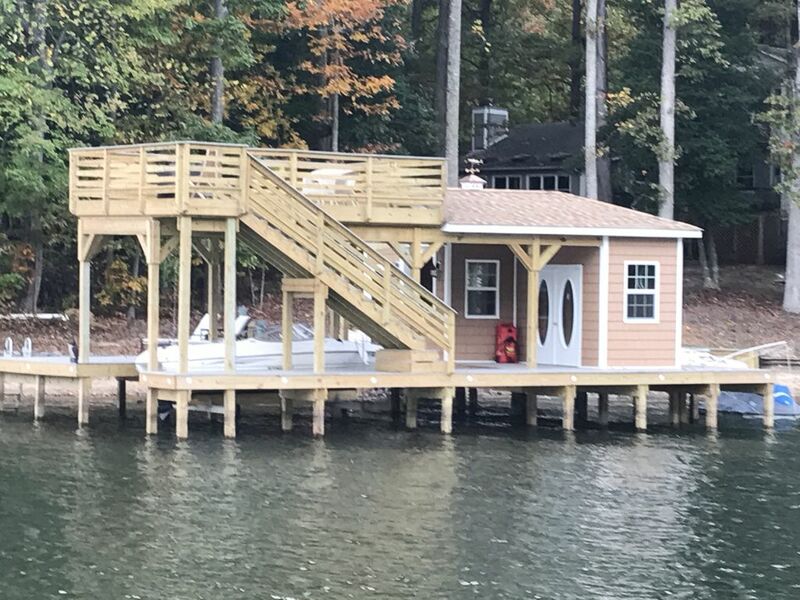 There is a brand new boat house built in Summer of 2017. Lakefront of 650 feet located just 20 steps from the back door of the home. 2 separate dining area, one seats 4, the other seats 6. Just 5 miles to the new Cutalong Golf Course. Our family stayed here for Thanksgiving with our dogs. The boathouae and docks are very nice and the firepit was great for smores and staying warm! The interior needs some updating but the main living area was spacious and great for gathering. The fishing was awesome and the kids caught lots of fish even though it was very cold!! Every year, I do up-dates, last year it was the; second dock (yes, now I have 2 docks), expanded the beach area, boat-lift, and boathouse. This off-season, I am updating furniture on main floor as well as all bedding. This will all be in place by Spring 2019. Every year, I do make necessary improvements. On site boat rental was made super easy by Steve. Unlike other places where you have to book your boat rental days or weeks ahead of time, within a few minutes you can request the use of the boat and be on the water fast. We had a blast and loved the scenic views! This client was able to rent my boat and was able to pick days that had good weather while he was at the house for a week stay (we had been in a rainy period). We were able to do the transaction right thru PayPal within minutes. Talk about easy!!! We had a great time! The house is very nice with lots of space. The lakefront property is amazing! We rented the boat and had a blast on the big tube. The new boathouse is beautiful! We will be back. Yet an additional stellar review, and another returning client. I think they enjoyed the wonderful Keurig too!!! Perfect, relaxing, lake get away to reboot from everyday life. This place was amazing and fulfilled all my lake get away needs. The location of the property is perfect. It was in a private settings with no neighbors to stare at you, while hanging out on the water. We loved the beach entrance between the two docks where the kids played for hours!! It was so very convenient to have rental boats on site, that we didn't have to drag our own, and was already, ready for us. The house was very roomy, clean, and with a beautiful updated kitchen. With all the amenities and household supplies available for use, it definitely felt like I was invited into a family members home. Thrilled that everyone enjoyed the property. I have worked very hard the lat few years to make improvements to the property to enhance enjoyment. Plus this is the only property at Lake Anna with boat and jet ski options. Even VRBO gave me Premier Status for my listing!! Majestic tall trees, a boathouse to die for. I used the jet ski and boat.......what a blast. There are so many things to do; horseshoes, basketball hoop, kayaks, swimming, tubing. A few of the kids learned how to wakeboard too. I highly recommend itthis place. Gorgeous outdoor areas; a bit shabby inside. I rented this house to celebrate a friend's birthday weekend. It's a good choice if you plan to spend most of your time outside, but leaves a bit to be desired in terms of feeling like a Nice Vacation Experience indoors. I would consider staying here again for a weekend but would not want to spend a week-long vacation. The lakefront outdoor areas are beautiful and relatively private. The large dock and multi-level deck were wonderful for lounging together and watching the sunset, and the firepit/seating area was really lovely. The main floor of the house -- living areas and kitchen -- are spacious and have a nice layout for feeding a group of 8-10. The kitchen is pretty well-appointed, though there were some minor annoyances, like that the only coffee maker is a Keurig, which requires special cartridges, and the listing doesn't indicate this, so we had to make an extra trip out to the store (and those cartridges are expensive!). The interior decor is a bit dated, which is totally fine for a casual weekend at the lake, but the house doesn't seem very well cared for. Several cords for electronic items (DVD player, etc) hang right next to the fireplace, some of the lights and light switches don't work, there are missing or broken fixtures in some of the bathrooms, and the ceiling fan in the second queen bedroom barely moves. The bedrooms are sparsely decorated, and the mattresses felt old and uncomfortable. Definitely bring your own pillows! Overall, this home did what we needed it to do, and we loved the outdoor areas, but the inside needs a little more love. Last year, I did major renovations on the waterfront. This off season, I will be buying new interior furniture, and replacing all of the bedding. I will also take care of all of the annoyances that she mentions. Tho the second bedroom fan has a pull chord, and was easily remedied by pulling it for faster fan speed. I believe in my 15 years, that was the first complaint about providing a Keurig for clients......I love those things. I have one at my house and office!!!!! As you can see by the many other responses, I go out of my way to keep clients happy. I check in with them frequently as well. I actually take pride in doing so. Try as I might, I guess you can't please everyone. Kings Dominion is just 35 minutes from the home. Fish right off the dock, tube, water ski, swim to your hearts desire. There is nearby relic hunting and civil war battle fileds within 30 minutes (including Andrew Jackson Memorial). The Food Lion is just up the road at the New Bridge Landing shopping area. Within 45 minutes of this home is Richmond, Fredericksburg, and Charlottesville. Home is equipped with a router and laptop for high speed internet access. On Season Rates May thru September 1900 per week. Secondary Season Rates Sept - Oct, March 2-May 25 1500 per week. Rates Are negotiable for longer rental periods.http://ipad.aol.com/# Refundable Security Deposit is just 200.00 Cleaning Fee is 130.00 Minimum 2 night rental.